Cybercrime costs the global economy $445 Billion a year, more than the worldwide illicit drug trade, and even the GDP of many countries. And, targeted breaches are increasingly a tool of nation-states seeking intellectual property, dossiers on influential individuals, and devastating disruptions of business operations. But for all their variety, each of these attacks share a common thread — a kill chain that exploits privileged users and their credentials to gain access to sensitive systems. Privileged access management is the most direct means of disrupting the kill chain and stopping attackers before they ever get started. 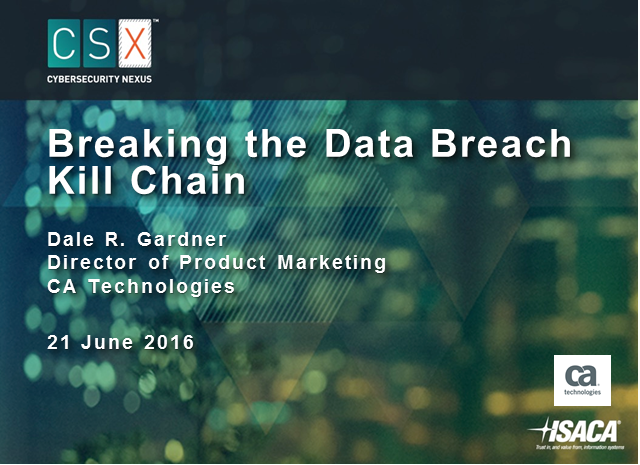 Join CA Technologies Dale Gardner and ISACA in an informative discussion on how to break the kill chain. • How to master the processes and tools needed to easily disrupt the kill chain, stopping attackers in their tracks and preventing breaches.